The instant I saw this deluxe bathroom featured in March's House Beautiful I fell in love and took a mental image to file away under "Future House." 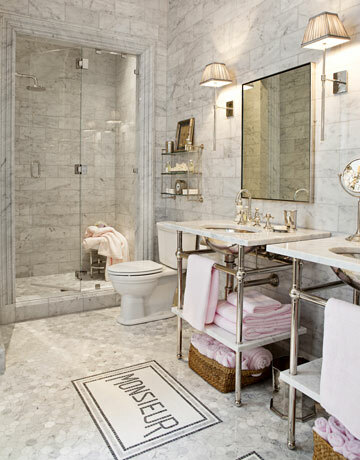 This gorgeously appointed room is swathed in Carrara marble and features a to-die-for soaking bathtub from Waterworks inspired by an antique french copper tub. 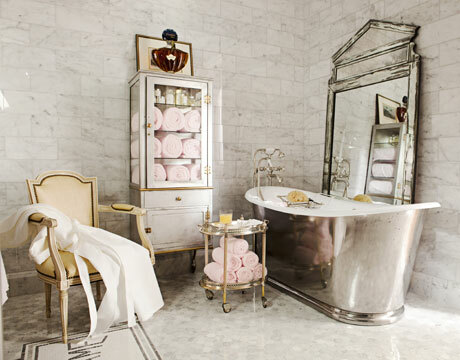 I am also coveting the gigantic mirror propped behind the tub. The pediment on the mirror is an ingenious way to bring a sense of the old-world into this luxurious room by mimicking the large salon windows of Parisian architecture. The Monsieur and Madame bathmats in front of the sinks are actually mosaics inlaid right into the floor - what a wonderful idea! Reading the brief article I was amazed to discover that this was only a guest bathroom. Just seeing the images, I assumed it was the master bathroom.Those are some mighty lucky guests, how can I get an invite? 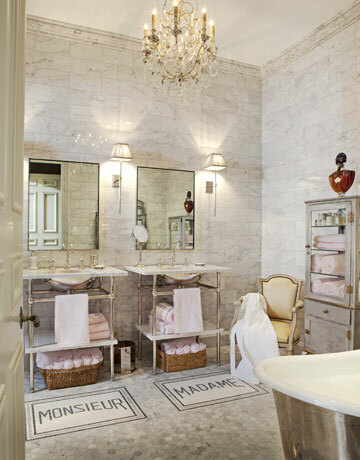 Not sure how many "monsieurs" would be thrilled with all pink towels but I love it!